For over ten years, Aon has started his daily activities with his wife and young child in a modest home in Bo Sang, a village on the eastern outskirts of the Thai city of Chiang Mai. He spends the majority of the morning and early afternoon carving soaps or working with his co-op that allows him to source materials used to create his beautiful art: pine, coconut, or mango wood containers with nickel and tin ornamentation, and the beautiful mulberry paper mache boxes that Pankesum products come in. In the evenings, you can always find Aon selling his artworks at the Kalare Night Bazaar, part of Chiang Mai's world famous night bazaar. On Sundays, he opens up a small stall in the equally famous Sunday Night Walking Street. Aon's soap flowers are encased in decorative case and box. His attention to detail original drew the attention of Pankesum traders and eventually the Discovery Channel show "How it's Made". He spends roughly 30 minutes hand-crafting each piece of soap, and the years it took him to master the ability to work with that speed is evident when you watch him work. All he uses are a couple soap carving knives, a bar of soap, and some water color. Over the past couple years, dozens of other soap carvers have emerged, and the art form has spread throughout Thailand and beyond. The new soap carvers' work is generally not up to par and we vigorously test this by literally throwing a packaged boxed carved soap down from 5 feet up. Since we ship from thousands of miles away, it is the least we can do to ensure you are getting the best quality. Coupled with Amazon's world class customer service and overnight or Prime delivery, you are getting the best deal out there. The soaps are great bathroom decorations, are beautiful to look at, and are fragrant. They are also a very unique art form guaranteed to remind you of Northern Thailand and are a great conversational piece. Display them in your bathroom, living room, or bedroom! 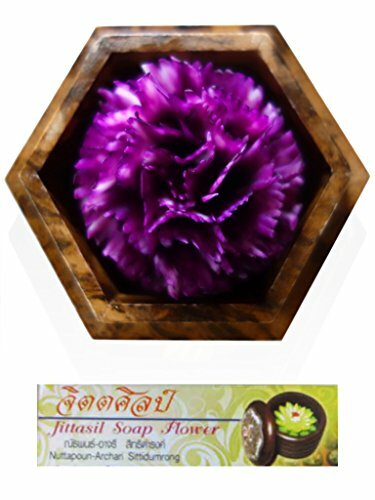 The soap carver was featured on Discovery Channel's "How It's Made"
If you have any questions about this product by Jittasil Hand-Carved Soap, contact us by completing and submitting the form below. If you are looking for a specif part number, please include it with your message.